Daredevil is a 2003 American superhero film written and directed by Mark Steven Johnson. Based on the Marvel Comics character of the same name, the film stars Ben Affleck as Matt Murdock, a blind lawyer who fights for justice in the courtroom and out of the courtroom as the masked vigilante Daredevil. Jennifer Garner plays his love interest Elektra Natchios; Colin Farrell plays the merciless assassin Bullseye; David Keith plays Jack "The Devil" Murdock, a washed up fighter and Matt's father; and Michael Clarke Duncan plays Wilson Fisk, also known as the crime lord Kingpin. The film began development in 1997 at 20th Century Fox and Columbia Pictures, before New Regency acquired the rights in 2000. Johnson shot the film primarily in Downtown Los Angeles despite the Hell's Kitchen, Manhattan setting of the film and comics. Rhythm and Hues Studios were hired to handle the film's CGI. Graeme Revell composed the Daredevil score which was released on CD in March 2003, whereas the various artists soundtrack album, Daredevil: The Album, was released in February. Though reviews of the film were mixed, the movie became the second-biggest February release to that time. A spin-off film, Elektra, was released in 2005 to critical and commercial failure. In 2004, an R-rated director's cut of Daredevil was released, reincorporating approximately 30 minutes of the film, including an entire subplot involving a character played by Coolio. Matt Murdock is a blind lawyer in New York City's Hell's Kitchen neighborhood, where he runs a firm with best friend Franklin "Foggy" Nelson. As a child, Matt was blinded by a toxic waste spill. The accident enhanced Matt's other senses and gave him sonar to "see" via sonic vibrations. Matt's father, boxer Jack "The Devil", was killed after refusing to turn in a fixed fight for the mobster who had employed him earlier. After his father's death, Matt promised to stop all crime that controlled Hell's Kitchen, New York as the vigilante crime-fighter "Daredevil". Matt meets Elektra Natchios, daughter of Nikolas Natchios, a businessman who has dealings with Wilson Fisk, a rich executive who is also the criminal leader known as the Kingpin. When Nikolas tries to end his relationship with Fisk, the mobster hires the Irish hitman Bullseye, who has preternatural aim, to kill him. Matt tries to stop Bullseye, but Bullseye ultimately succeeds in killing Nikolas and framing Matt in the process. Elektra vows to exact revenge, while reporter Ben Urich discovers his secret identity. Believing Matt to have done good things for Hell's Kitchen, Urich tells Matt that Bullseye is going after Elektra next. Matt tracks Bullseye, but is attacked by Elektra, who plans to use her own training in martial arts to avenge her father's death. She defeats and injures Matt; when she manages to remove his mask, she discovers Matt's secret identity and innocence. Forced to fight Bullseye alone, Elektra is overpowered and killed by the hitman. A wounded Matt makes his way to a church, where he is looked after by his confidante, Father Everett, who knows his secret identity. After recovering slightly, Matt fights Bullseye, who had followed him to the church. Bullseye discovers that loud noise is Matt's weakness and prepares to kill him with a spiked piece of wood after incapacitating him. Matt blocks the attack and hears an FBI sniper stationed on the neighboring building preparing to fire. As the bullet is fired, Matt moves out of the bullet's path and pulls Bullseye's hands into it. When Bullseye pleads for mercy, Matt throws him from the church's steeple. Bullseye lands on the hood of Urich's car, severely injured but alive. Upon discovering Fisk is the Kingpin and Bullseye's employer, Matt makes his way to Fisk's office. There, Matt and Fisk begin a fierce fight; however, Fisk proves to be a surprisingly powerful combatant due to his size and brute strength, and he dominates Matt for most of the fight. Lying on the floor, Matt questions Fisk as to why he killed the people Murdock loved, including Jack Murdock years before: Fisk replies it was just business, for he had worked under Fallon at the time he killed Jack, and Elektra was "at the wrong place at the wrong time." Angered, Matt regains his strength and breaks Fisk's legs, but refrains from killing him, instead allowing him to be arrested by the police, who have discovered his criminal connections. Before being taken away, Fisk — who had also discovered Matt's secret identity after overpowering him — swears revenge on Matt, who points out that Fisk cannot reveal Matt's secret identity because the humiliation of having been beaten by a blind man will cause him to be perceived as weak by other prison inmates. Having gained closure over his father's murder, Matt returns to his day-to-day routine, and meets Urich one last time, in which Urich assures him he will not publish his article about Matt's true identity. In a mid-credits scene, Bullseye, having been moved to a prison hospital and severely bandaged after his confrontation with Matt, is shown to still have his perfect aim after he impales a fly with a syringe needle and says "Bullseye." An attorney-at-law with a disability who was blinded as a youth in an accident with bio-waste that drastically heightened his remaining senses and gave him a "sonar-sense", which allowed him to perceive his surroundings, and makes a silent promise with his father to "stick up for the long shots". His father is killed not long after and at that moment, he vows to seek justice. At night, he becomes a devil-modeled vigilante who takes justice into his hands. Affleck was cast in October 2001. Vin Diesel was considered to portray Daredevil before him, but he opted to take a role in another film. In a February 2011 interview, Guy Pearce said that he was offered the role but turned it down, stating that "comic-strip stuff isn’t really my cup of tea, really." Matt Damon also revealed that he was offered the role. He claimed that he and Ben "loved that comic book but I just didn't quite believe in the script or the director at the time." Colin Farrell was also considered until Affleck signed. As a fan, Affleck made sure he had read every single issue of Daredevil, commenting that it was about taking what he knew as a fan and faithfully getting it on the screen. Joe Quesada considered it "serendipity in action" that Affleck is the lead role, as when he and Kevin Smith did the Guardian Devil series, they had modeled it on Affleck. Affleck said Daredevil was his favorite comic book as a kid, and explained why he took the role by saying "Everybody has that one thing from childhood that they remember and that sticks with them. This story was that for me." Additionally, he said, "I didn't want someone else to do it, because I was afraid that they would go out and do it different from the comic and screw it up." As a youth, he has trouble with local bullies and a close bond with his father. This changes in different ways after the accident. Terra was officially announced as a part of the cast in March 2002. The daughter of billionaire Nikolas Natchios and the love interest of Matt Murdock. At a very young age, she witnessed the murder of her mother, and since then her father has had her become highly trained in martial arts. For the role of Elektra, many actresses were looked into with considerations including Penélope Cruz, Salma Hayek, Natalie Portman, Lucy Liu, Jessica Alba, and Katie Holmes. A short-list was eventually made, giving the choices of Jennifer Garner, Jolene Blalock, Mía Maestro and Rhona Mitra, with Garner finally becoming the actress to land the role. Garner said of the character, "I think she's strong and cool and beautiful and smart. She'd be a good role model." Garner noted the costume would be different, as Elektra in comics often wears red satin but in the film wears black leather. Garner explained, "[T]he red would never have worked for hiding a harness, and I know this sounds ridiculous, but you have to protect your skin a little bit. They throw me around so much on the rooftop [that] I got cut through the leather, so imagine if I hadn't had anything." By appearance, he is an overweight corporate head that takes the name Wilson Fisk, but in fact he is the sole person running organized crime, under the moniker of Kingpin. Kingpin is the murderer of Matt's father, and the man responsible for the hiring of Bullseye, with intention of having the Natchios family murdered. Michael Clarke Duncan signed on for the role in January 2002, though he had been attached far earlier. When Duncan was cast, he weighed 290 pounds. He was asked to gain 40 pounds for the role in order to fit the physique of Kingpin. In order to do this, he would lift weights for 30 minutes a day, and power-lifted with one or two reps a day, as well as eating whatever he wanted. Despite this, Duncan's biggest concern was that he is black, while Kingpin has always been portrayed as white. Also, Duncan provided the voice for Kingpin in Spider-Man: The New Animated Series. He spoke on the fan's loyalty to the source material by saying "they watch movies to say, 'Hey, that's not like the comic book.' But I want them to get past that and just see the movie for what it is and see me for what I am—an actor." An assassin with perfect accuracy and deep-rooted pride of it who is hired by Kingpin to kill Nikolas and Elektra Natchios, but when Daredevil gets involved and causes him to miss his target, he makes it his own personal vendetta to take Daredevil down. Farrell was attached to the role in December 2001. Mark Steven Johnson credits Joe Quesada with talking him out of using the traditional Bullseye costume for the film, and Farrell was encouraged to keep his Irish accent as this version of Bullseye is from Ireland. Farrell had to read Frank Miller's Daredevil comics to understand Bullseye "because the expression on the character's faces in the comic books, and just the way they move sometimes, and the exaggerations of the character I'm playing […] he's so over-the-top that you do draw from that. But it's not exactly a character you can do method acting for... you know, running around New York killing people with paper clips." Matt Murdock's legal partner and best friend, he is also used as a form of comic relief. Favreau joined the cast in February 2002. Favreau would later go on to direct the Marvel-produced Iron Man and its sequel, Iron Man 2 while also appearing as Happy Hogan. An investigative journalist whose articles notably relate to Daredevil, and the Kingpin. During the film, he goes on to uncover a lot of information about the two. Pantoliano was cast in March 2002. Father of Matt Murdock and a boxer, he is murdered by the Kingpin when he does not take a fall for a fight. Keith was officially announced as a part of the cast in March 2002. The number two of Wilson Fisk, but he does not like to be involved in the activities of the Kingpin. Orser previously co-starred with Jon Favreau in 1998 in Very Bad Things. A NYPD cop who considers Daredevil an urban legend. The father of Elektra, who is murdered by Bullseye on behalf of the Kingpin. The secretary at Matt Murdock and Franklin Nelson's law firm. A priest of Matt Murdock's local church, where he sometimes goes to find solace. Stan Lee, Frank Miller, and Kevin Smith, each notable for their work on the Daredevil comics, also have cameo roles throughout the film. Mark Margolis has an uncredited role as Fallon, a mobster who once employed Fisk as a hitman. The director's cut version also features Coolio as Dante Jackson and features Jude Ciccolella in a sub-plot removed from the theatrical version. Tanoai Reed appears uncredited as a thug in Josie's Bar. In 1997, 20th Century Fox optioned the rights from Marvel Enterprises, and Chris Columbus was chosen to direct the film. In 1998, Marvel was facing bankruptcy. During this time 20th Century Fox allowed the option to expire, so Disney began negotiations in order to acquire the rights. In 1999, the negotiations failed to work out so Marvel set the project up with Sony's Columbia Pictures. During this time, Chris Columbus and Carlo Carlei co-wrote a script together, before Mark Steven Johnson got signed to write the screenplay. By 2000, Sony decided to cancel the project, as the two companies reportedly could not come to an agreement over Internet rights. New Regency entered negotiations with a more satisfying offer, attaining the character rights from Marvel in 2000 to produce the film, with 20th Century Fox handling the distribution. Mark Steven Johnson was rehired and his script was turned in during 2001, which was praised by Ain't It Cool News' Harry Knowles. Prior to shooting, producer Gary Foster said that in comparison to other comic book-based films before it, this film would be "more character-driven ... darker ... edgier," while Marvel Studios executive Kevin Feige felt the script was one of the strongest comic scripts Marvel had received. Fox wanted to start filming in Canada in order to save money. This plan was contended by Johnson, and the film's cinematographer, Ericson Core, after they found a preferred area for shooting around downtown Los Angeles' Arcade Building. Core noted that the appeal came from the "beautiful, old brick buildings and great rooftops," which they felt was perfect for a depiction of Hell's Kitchen, Manhattan, in comparison to the studio's choice where the filming would be done in Montreal or Vancouver. Due to their insistence, coupled with Ben Affleck's disinterest in filming in Canada (after having filmed there for his previous film, The Sum of All Fears) they were able to change the studio's mind. A side-by-side view of the scene from the Guardian Devil graphic novel, and the film. Several scenes were taken shot-for-shot of comic books. When the look of the film was being decided, Mark Steven Johnson opted to use direct scenes from the Daredevil comics. Joe Quesada's artistic take in Guardian Devil (Daredevil vol. 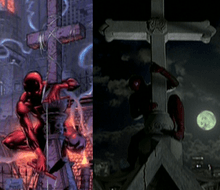 2, #1-#8) was an influence on the film, with Johnson noting that they would "literally take out a scene from the comic book that Joe did […] Here's Daredevil on the cross, you know, it's that scene from 'Guardian Devil'. You just shoot that." Throughout the film, Ben Affleck had to wear "cataract milky-blue" contacts, which would effectively make him blind. This was considered great by Johnson, as it would aid his performance. The sound plays an integral part in the film, as the superhero relies on it in order to form his 'sonar sense'. Post-production sound was done by supervising sound editor John Larsen and sound designer Steve Boeddeker and is heard taking place immediately after Matt's optic nerve is seen mutating. The mutating of the nerve was done by Rhythm and Hues Studios, who also worked on the sonar-sense which became referred to as the "shadow world". Shadow world was made using just CGI except in a scene where Elektra and Matt Murdock are in the rain, which was done using CGI over film. The score to Daredevil was written by Graeme Revell, and released on March 4, 2003. He was attracted to the focus of "human-ness" on Daredevil, torn emotionally and physically by his superhero status. Avi Arad asked Revell to concentrate more on the emotions of Daredevil and Elektra, while Mark Steven Johnson wanted to stay clear from any gothic and action movie clichés. Revell tried to avoid too much individual motifs but some characters would have an identifiable sound, like Bullseye would have guitar undertones, while Kingpin would have bass beats. Guitarist Mike Einziger of Incubus collaborated with Revell for any additional rock elements. Revell thoroughly enjoyed working with Johnson, describing the director as "positive" and "responsive" when it came to experimenting (as opposed to feeling "locked in a box of preconceptions") which he felt lead to "cool stuff". Varèse Sarabande put together the score record. Aside from expected TV commercials during such TV hits as Friends and Law & Order, as well as one in the second quarter of Super Bowl XXXVII, there was also a tie-in with Kraft, an in-store promotion at Wal-Mart, a marketing campaign with Hamilton Watch Company, who designed the watch Matt wears in the film, and a weeklong Daredevil segment on Entertainment Tonight. As part of an online form of marketing, a viral e-mail drive was started, where participants would be entered in a contest where they could win prizes such as Daredevil T-shirts, Game Boy Advance games, and cufflinks. To enter the drawing, the user had to book tickets for the film online, then pass an e-mail on to someone else. The idea was to encourage online ticket booking, which at the time was seen as a growing trend. The Game Boy Advance Daredevil game was released on February 14, 2003, and was created by Encore, a subsidiary of Navarre Corporation. The soundtrack to the film, Daredevil: The Album, was released in February 2003. Due to the film's violent scenes, the Film Censorship Board of Malaysia banned Daredevil in that country. 20th Century Fox unsuccessfully appealed to Malaysia's censorship board to change its decision, hoping to release the film in Malaysia on February 27, 2003. The deputy prime minister told the press films were banned if containing what the board felt was "excessive violence and sexual material or elements which can create chaos in the community". The film opened theatrically on February 14, 2003, on 3,471 screens in North America and took first place in its opening weekend, grossing $45,033,454. At the time, it became the second biggest February release, behind Hannibal. By the second weekend the film saw a 55.1% decline in takings but managed to maintain the number one spot, beating new release Old School by $639,093. By the third weekend release, Daredevil saw a further 38.5% drop in sales, and so fell to third place at the box office. The film grossed over $102 million in North America, and over $76 million in the rest of the world, totalling the film's worldwide takings at just over $179 million, grossing over double its budget of $78 million. Avi Arad addressed the top spot success by saying "we are five for five with record-breaking box office successes [with Blade, X-Men, Blade II then Spider-Man] and have two more Marvel releases slated for this summer [which are X2: X-Men United and Hulk]. It's a testament to the broad appeal of these characters before mainstream audiences outside of the core comic fans. These super heroes have been successful within the Marvel pantheon for decades; it only makes sense that their translations to the big screen are just as fruitful." Daredevil received mixed reviews from critics. The review-aggregation website Rotten Tomatoes reported that 44% of critics gave the film positive feedback, based on 221 reviews, with the critical consensus reading, "While Ben Affleck fits the role and the story is sporadically interesting, Daredevil is ultimately a dull, brooding origin story that fails to bring anything new to the genre." On the website Metacritic the film has an average score of 42 out of 100, based on 35 critics, indicating "mixed or average reviews". Film critic Roger Ebert of the Chicago Sun-Times gave the film 3 out of a possible 4 stars and called the film good, despite noting the almost typical superhero background. Of the actors, he stated that Ben Affleck and Jennifer Garner were suitable for their roles, while Michael Clarke Duncan's presence alone was menacing. He said, "I am getting a little worn out describing the origin stories and powers of superheroes […] Some of their movies, like this one, are better than others." The Houston Chronicle's Bruce Westbrook considered it "the best Marvel movie to date, it's as well-written and character-driven as some of today's Oscar contenders, and its story doesn't stall with hollow flamboyance." The Austin Chronicle's Kimberly Jones praised the film, the actors, and felt that though an unproven director, "Johnson has just signed his meal ticket with this marriage of big brains, big brawn, and–most happily–big heart." Empire's Kim Newman gave the film 3 out of 5 stars, and felt people "will like the characters more than the film," before adding that there are enough strong moments to guarantee a good viewing. The Guardian's Peter Bradshaw stated that the film held "unconvincing touches" but was more enjoyable than Spider-Man and as dark as Tim Burton's Batman. BBC film critic Nev Pierce believed the film had spectacular set-pieces, but felt there was no strong narrative arc to keep the viewer interested. The Wall Street Journal's Joe Morgenstern considered the film to be neither original nor great but felt it maintained "many grace notes and interesting oddities." The Globe and Mail's Rick Groen said the film was "not woeful, not wonderful, merely watchable." The Philadelphia Inquirer's Steven Rea thought the film brought a variance of humor and violence, but felt it didn't work as well as it could have. James Berardinelli felt it was merely a satisfactory superhero film. TV Guide's Frank Lovece said Daredevil "makes clear that superhero films are the next evolutionary generation of action movies: Now that Schwarzenegger-styled heroes have upped the action ante as far as the human body can go and remain even marginally believable, it's up to superheroes ...to take it further." He also felt it was "a movie for grown-ups, not kids." Particularly negative reviews included that of The New York Times' Elvis Mitchell, who said the film was "second-rate and ordinary," while Variety's Todd McCarthy considered it "a pretender in the realm of bona fide superheroes." Entertainment Weekly's Owen Gleiberman gave the film a "C-", criticizing the story as "sloppy" and "slipshod", saying, "Daredevil is the sort of half-assed, visually lackadaisical potboiler that makes you rue the day that comic-book franchises ever took over Hollywood." Time Out's Trevor Johnston praised Ben Affleck, feeling he "persuades us of the pain of sightlessness and supersensitive hearing," but also felt writer/director Johnson's construction fails all involved in the film. Slate's David Edelstein believed Johnson copied a lot of Batman, and concluded by saying "that's not so bad: The movie looks best when it looks like other, better movies." The Chicago Tribune's Michael Wilmington thought the film grabs the attention, but felt it does not reward it. The New York Post's Lou Lumenick panned the film, describing it as a "mind-numbing, would-be comic-book franchise, which often seems as blind as its hero -- not to mention deaf and dumb." Character co-creator Stan Lee himself felt, "[T]hey just wrote the whole thing wrong. They made him too tragic." Ben Affleck won the Golden Raspberry Award for Worst Actor for his work in the movie, as well as for Gigli and Paycheck. A director's cut of the film was announced for a spring 2004 DVD release. This version contained new additions like previously unseen footage and a removed subplot, and was to be a bit darker with an R rating. The film, released in 2.35:1 widescreen format, was released with DTS and Dolby Digital sound. The new version of the film has newly recorded commentary to accompany it, featuring Mark Steven Johnson and Avi Arad. A "Making of Director's Cut" featurette also accompanied the film. The release date of the DVD was later pushed back to November 30, 2004. On September 30, 2008 the director's cut was released on Blu-ray. The DVD release of the director's cut removed the bonus material included on the theatrical cut's DVD release, but that content was restored for the Blu-ray release (although the Blu-ray release only contains the director's cut). One of the biggest changes to the film was the addition of a subplot involving a drug addict played by Coolio. While this subplot was missing from the theatrical version of the film, it is present in the novelization by Greg Cox, published in 2003. Producer Kevin Feige commented on this version of the film, believing "the people who had other opinions [of Daredevil] will be won over by this new version." Reviewers like Empire's Danny Graydon seemed to reaffirm this opinion by considering this version a "considerable improvement on the original version," notably preferring the more violent undertones, a lesser focus on the romance, and the equal focus of Daredevil and his lawyer alias Matt Murdock and the subplot involving Coolio. Some critics continued to feel Affleck was unsuitable as Daredevil and that Duncan portrayed the Kingpin in an over-the-top manner. IGN's Jeff Otto and Andy Patrizio also deemed this version an improvement over the original. They felt this version was more loyal to the Frank Miller feel of the Daredevil world, with more focus on themes such as Murdock's struggle with his Catholic upbringing. On the whole they felt the film would be far more pleasing to the fans, and overall better than the theatrical release. Feige had stated on potential future Daredevil films, "there are many more stories to be told with old Hornhead and we'd love to tell them someday." Avi Arad has also said that a sequel will begin development once the rights go from 20th Century Fox to Marvel Studios. Director Mark Steven Johnson showed interest in returning to direct with the Born Again storyline, as well as suggesting Mr. Fear as a possible villain. During 2004, Ben Affleck shot a cameo role for the spin-off film, Elektra, at the request of Daredevil co-star Jennifer Garner. In October 2004, Affleck stated he would only return in the lead role if Fox would renegotiate to tell the darker stories of Daredevil, and showed interest in a Kevin Smith graphic novel which included Mysterio, as well as the Born Again storyline. However, in November 2006, Affleck stated that he would never reprise the role, having felt "by playing a superhero in Daredevil, I have inoculated myself from ever playing another superhero... Wearing a costume was a source of humiliation for me and something I wouldn't want to do again soon." Despite this, Affleck would later sign on to portray another superhero, Bruce Wayne/Batman, in Batman vs. Superman. In July 2006, Michael Clarke Duncan showed interest in returning for the role of the Kingpin, but stated that he would not be willing to gain weight as he felt "comfortable" being down to 270 pounds. However, he jokingly showed willingness to change his mind if he was offered $20 million. Duncan suggested that the character is portrayed to have been training a lot in jail in order to become faster in combat against Daredevil, also working as a way to fit his weight loss into the story. Duncan would later go on to reprise his role as the Kingpin in an episode of the animated series: Spider-Man: The New Animated Series. In July 2008, Jason Statham expressed interest in appearing as Daredevil in the future. Statham requested "just give me the chance, I would love to be Daredevil." Frank Miller commented in agreement "I think he should be Daredevil too." In October 2008, 20th Century Fox executive Tom Rothman said "a Daredevil reboot is something we are thinking very seriously about." Rothman added that "what it really needs is, it needs a visionary at the level that Chris Nolan was. It needs someone, it needs a director, honestly, who has a genuine vision." By February 2010, 20th Century Fox and New Regency were looking to develop the reboot with News Corp., with Peter Chernin producing and David Scarpa writing the script. On March 15, 2011, it was announced that filmmaker David Slade would be directing the reboot, but he later had to drop out due to other obligations. Fringe writer and producer Brad Caleb Kane was hired to pen the Slade-directed film. On September 3, 2012, Duncan died, precluding him from reprising his role as Kingpin. Later, it was announced that should a sequel or reboot not start filming by October 10, 2012, the rights to the Daredevil franchise would revert from Fox back to Marvel. In early August 2012, Fox scrambled to find a replacement for David Slade, who dropped out of the director's chair due to scheduling conflicts. The studio briefly met with Joe Carnahan, for the job—however, Carnahan said on Twitter that his pitch, described as a hard-boiled '70s thriller, had gone up in smoke. Several sources commented that Fox had given up on the reboot, and were prepared to let the rights revert to Marvel and their parent company, The Walt Disney Company. On April 23, 2013, Kevin Feige confirmed that the rights for Daredevil returned to Marvel Studios and Disney, opening the possibility of including the character into the Marvel Cinematic Universe. That speculation was confirmed with the announcement of an original Netflix Daredevil television series, which premiered on the streaming service in April 2015, with English actor Charlie Cox in the title role. ↑ "DAREDEVIL (15)". British Board of Film Classification. February 5, 2003. Retrieved January 1, 2016. 1 2 3 "Daredevil". Box Office Mojo. Retrieved May 12, 2008. ↑ Swanson, Tim (October 3, 2001). "Affleck homes in on Daredevil role". Variety. Archived from the original on February 22, 2015. Retrieved February 21, 2008. ↑ Watkins, Gwynne (February 25, 2011). "Guy Pearce on Batman, Being Offered Daredevil, and Avoiding Terrible Scripts". New York. Archived from the original on February 22, 2015. Retrieved March 6, 2011. ↑ Reynolds, Simon (February 27, 2011). "Matt Damon: 'I almost played Daredevil'". The Times (London) via Digital Spy. Archived from the original on August 29, 2015. Retrieved March 6, 2011. 1 2 Swanson, Tim (December 5, 2001). "Farrell targets Daredevil". Variety. Archived from the original on September 7, 2014. Retrieved February 21, 2008. 1 2 3 Worley, Rob (August 7, 2002). "Daredevil". Comic Book Resources. Archived from the original on July 23, 2015. Retrieved May 12, 2008. ↑ Downey, Ryan J. (June 24, 2002). "Affleck, Garner Open Up About Daredevil". MTV. Archived from the original on August 22, 2015. Retrieved February 21, 2008. ↑ Gunn, John (June 20, 2002). "Daredevil Press Day!!". JoBlo.com. Archived from the original on June 6, 2011. Retrieved February 21, 2008. 1 2 3 4 5 Downey, Ryan J. (February 6, 2003). "Ben Affleck Dares to Dream Daredevil". MTV. Archived from the original on August 26, 2015. Retrieved February 21, 2008. 1 2 Stax (March 27, 2002). "More Daredevil Casting Tidbits". IGN. Archived from the original on April 20, 2015. Retrieved February 21, 2008. 1 2 Stax (January 27, 2002). "Daredevil's Done Deals". IGN. Retrieved March 24, 2008. ↑ Downey, Ryan J. (June 3, 2002). "Jennifer Garner, Ben Affleck Suit Up For Daredevil". MTV. Retrieved February 21, 2008. ↑ McNary, Dave (January 9, 2002). "Duncan takes on Daredevil". Variety. Retrieved February 23, 2008. ↑ Epstein, Daniel Robert. "Michael Clarke Duncan Interview". UGO. Retrieved February 23, 2008. ↑ "Colin Farrell Interview". UGO. Retrieved February 22, 2008. ↑ McNary, Dave (February 22, 2002). "Daredevil has partner in Favreau". Variety. Retrieved February 24, 2008. ↑ McNary, Dave (March 17, 2002). "IGN FilmForce Exclusive: Which Matrix Star Has Been Cast in Daredevil?". IGN. Retrieved February 24, 2008. 1 2 3 4 "Beyond Hell's Kitchen": Making Daredevil (DVD). 20th Century Fox. 2003. ↑ Stax (April 26, 2001). "Daredevil: The Man Without Ed". IGN. Retrieved March 6, 2008. ↑ KJB (July 12, 2000). "Daredevil Exits Columbia". IGN. Retrieved March 6, 2008. ↑ Fleming, Michael (July 12, 2000). "Marvel's Daredevil on pic trail". Variety. Retrieved February 14, 2008. ↑ Knowles, Harry (April 2, 2001). "Harry reviews Mark Steven Johnson's Perfect Daredevil script!!!". Ain't It Cool News. Retrieved February 14, 2008. ↑ Stax (July 11, 2001). "Daredevil Ready for a Fall Start?". IGN. Retrieved March 6, 2008. ↑ Stax (July 26, 2001). "Make Way for Daredevil". IGN. Retrieved March 6, 2008. ↑ Calhoun, John (March 2003). "Man Without Fear". American Cinematographer. Retrieved May 23, 2008. 1 2 Daredevil (DVD). 20th Century Fox. 2003. ↑ Head, Steve (February 6, 2003). "Incoming: Daredevil Score CD News". IGN. Retrieved May 8, 2008. ↑ Mithra, Kuljit (February 2003). "Interview With Graeme Revell". ManWithoutFear.com. Retrieved May 8, 2008. ↑ Strandberg, Keith W. (January 31, 2003). "Hamilton Appears in New Daredevil Movie". AllBusiness.com. American Time. Archived from the original on October 28, 2008. Retrieved December 4, 2008. ↑ Grover, Ron (February 3, 2003). "For Fox, It's Daredevil vs. February". BusinessWeek. Retrieved June 9, 2008. ↑ Billings, Claire (February 11, 2003). "Fox boosts email database with Daredevil promotion". Brand Republic. Retrieved June 9, 2008. ↑ "Daredevil for Nintendo Game Boy Advance Ships to Retailers". FindArticles.com. Business Wire. February 3, 2003. Retrieved June 10, 2008. ↑ "For The Record: Quick News On Foo Fighters, Daredevil, Saliva, Glassjaw, Iron Maiden, Stone Sour & More". MTV News. January 3, 2003. Retrieved December 17, 2008. ↑ "Malaysia bans Affleck's Daredevil". BBC News. February 14, 2003. Archived from the original on January 6, 2015. Retrieved April 24, 2010. ↑ Brandon Gray (February 18, 2003). "Daredevil Hits Box Office Bullseye". Box Office Mojo. Retrieved May 12, 2008. ↑ "Weekend Box Office: February 21–23, 2003". Box Office Mojo. Retrieved May 12, 2008. ↑ "Daredevil Weekend Box Office". Box Office Mojo. Retrieved May 12, 2008. ↑ "Marvel Proves Heroic at the Box Office; Daredevil is Third Consecutive Marvel Studios Motion Picture Release to Capture Top Box Office Position". FindArticles.com. Business Wire. February 26, 2003. Retrieved May 12, 2008. 1 2 "Daredevil". Rotten Tomatoes. Retrieved April 24, 2010. 1 2 3 4 5 6 "Daredevil". Metacritic. Retrieved February 26, 2008. ↑ Ebert, Roger (February 14, 2003). "Daredevil". Chicago Sun-Times. Retrieved February 26, 2008. ↑ Westbrook, Bruce (March 26, 2004). "Daredevil". Houston Chronicle. Archived from the original on March 3, 2008. Retrieved April 24, 2010. ↑ Jones, Kimberly (February 14, 2003). "Daredevil". The Austin Chronicle. Retrieved February 26, 2008. ↑ Newman, Kim. "Daredevil". Empire. Retrieved February 26, 2008. ↑ Bradshaw, Peter (February 14, 2003). "Daredevil". The Guardian. Retrieved April 24, 2010. ↑ Pierce, Nev (February 12, 2003). "Daredevil". BBC. Retrieved February 26, 2008. ↑ Morgenstern, Joe (February 14, 2003). "Daredevil". The Wall Street Journal. Retrieved February 26, 2008. ↑ Lovece, Frank. "Daredevil". TV Guide. Retrieved April 24, 2010. ↑ McCarthy, Todd (February 14, 2003). "Daredevil". Variety. Retrieved February 26, 2008. ↑ Gleiberman, Owen (February 14, 2003). "Review: 'Daredevil' is a dud". Entertainment Weekly. Retrieved July 21, 2015. ↑ Johnston, Trevor (February 14, 2003). "Daredevil". Time Out. Retrieved February 26, 2008. ↑ Edelstein, David (February 14, 2003). "Ben in Tights". Time Out. Retrieved February 26, 2008. ↑ Paur, Joey (n.d.). "Stan Lee Reveals His Least Favorite Marvel Movies". GeekTyrant.com. Archived from the original on October 30, 2012. Retrieved February 27, 2013. 1 2 3 "Daredevil Movie Update". ComicsContinuum. January 22, 2004. Retrieved December 22, 2008. ↑ "Pre-Order the Daredevil Director's Cut!". Superhero Hype!. August 25, 2004. Retrieved December 22, 2008. ↑ McCutcheon, David (August 8, 2008). "Daredevil Defies Blu-ray". IGN. Retrieved December 22, 2008. ↑ Cox, Greg (January 7, 2003). Daredevil: A Novel (Paperback). Novelization of the film. Onyx. ISBN 0-451-41080-7. ↑ Graydon, Danny. "Daredevil: The Director's Cut (15)". Empire. Retrieved December 22, 2008. ↑ Otto, Jeff; Patrizio, Andy. "Daredevil: Director's Cut". IGN. Retrieved December 22, 2008. ↑ Carroll, Larry (June 2005). "Future Shocks: What's Ahead for Avi Arad and His Marvel Empire". MTV. Retrieved February 18, 2008. ↑ Epstein, Daniel Robert. "Mark Steven Johnson, director of Daredevil (Fox)". UGO. Retrieved February 18, 2008. ↑ "High in the sky Benny bares all". The Sydney Morning Herald. July 29, 2004. Retrieved December 23, 2008. ↑ Sanchez, Robert (October 15, 2004). "Ben Affleck on a Possible Daredevil Sequel". IESB. Archived from the original on October 20, 2004. Retrieved April 24, 2010. ↑ Sciretta, Peter (November 2, 2006). "Ben Affleck says No to Daredevil sequel". UGO. Archived from the original on August 11, 2008. Retrieved July 15, 2008. ↑ "Batman V. Superman: Dawn Of Justice Has Officially Begun Filming". Time. May 21, 2014. Retrieved May 22, 2014. ↑ Chavez, Kellvin (July 6, 2006). "Duncan Not in Transformers But Talks Daredevil 2!". LatinoReview.com. Archived from the original on March 1, 2007. Retrieved April 24, 2010. ↑ Boucher, Geoff (July 31, 2008). "Jason Statham: "I want to be Daredevil."". Los Angeles Times. Retrieved December 4, 2008. ↑ Boucher, Geoff (October 2, 2008). "IESB Exclusive: FOX's Tom Rothman on a Daredevil Reboot". IESB. Retrieved December 4, 2008. ↑ Fleming, Mike (February 5, 2010). "Exclusive: Latest Marvel Hero To Reboot". Deadline Hollywood. Retrieved February 7, 2010. ↑ Vary, Adam B. (March 15, 2011). "David Slade to direct 'Daredevil' quasi-sequel". Entertainment Weekly. Retrieved March 15, 2011. ↑ Kit, Borys (June 7, 2011). "Fox's 'Daredevil' Relaunch Hires 'Fringe' Writer Brad Caleb Kane". The Hollywood Reporter. Retrieved June 7, 2011. ↑ "Statement on the death of Michael Clarke Duncan". BNO News. September 3, 2012. Retrieved September 3, 2012. ↑ "Michael Clarke Duncan dead at 54: 'Green Mile' actor dies nearly two months after suffering heart attack". Daily News. New York. Associated Press. Retrieved September 3, 2012. ↑ Nguyen, John (October 12, 2012). "Welcome back, Daredevil, to the Marvel Studios family". Nerd Reactor. Retrieved October 14, 2012. ↑ Fleming Jr., Mike (April 23, 2013). "TOLDJA! 'Daredevil' Rights Revert From Fox To Disney". Deadline Hollywood. Retrieved April 23, 2013. ↑ Greenwood, Carl (November 17, 2013). "Four new Netflix Marvel superhero shows include remake of Ben Affleck's Daredevil". Daily Mirror. Retrieved February 8, 2014.